Valeria’s images explore the inseparable ink of the human race with nature and our reciprocal evolution with the other life forms that share this planet. Inspired by deities of ancient religions, myths,and folklores, she combines human and animal features to let the spirits,hidden from our eyes, emerge. More than likely, they are hung in unlikely spaces. Her installation of dyed clothing , called “A Bird in Flight is an Omen,” hung on a clothesline in Tribes’ back yard for five months, with enough dye left on some of the cloth to allow the elements to have their effect. She has been making art since the early sixties and has exhibited extensively in New York, Japan, Europe, especially Italy, Mexico and India. Her last solo show was in her father’s hometown of Bari, Italy. Her films, often of repetitive acts, become a meditation on the ephemeral. She has taught art to a wide and varied audience, most recently at Parsons School of Art and Design. Otomo’s words are set around Valeria’s images in motion, sometimes relating directly to the images shown and other times unrelated to them. 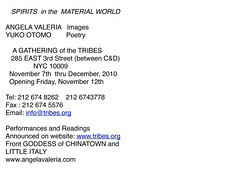 These clips and lines are selected from her collection of poetry and she has composed a new poem, particularly for this exhibition, titled “I am Vermillion” With her double identity as a poet and a visual artist, Otomo has read her poetical work in various venues such as Poetry Project at St. Marks, P.S.1, Queens Museum, New York Public Library, NYU, La Mama, Issue Project Room, Brooklyn Botanic Garden, Bowery Poetry Club, and Tribes. 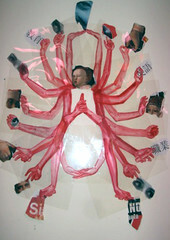 She has shown her Visual work in Tribes Gallery, Vision Festival, and Court House Gallery at Anthology Film Archives. Her publications include: ”A Sunday Afternoon on the Isle of Museum,” “ Small Poems,” “ Pink,” “ A Voice that Crawls in the Sky” and others. She also writes critical essays on art. She co-edited the visual art section with Jeffrey C Wright and also edited Japanese Contemporary Poetry section with Steve Dalachinsky for Tribes Magazine #12.